Cincinnati has a history of failed transit proposals like the abandoned subway system or the MetroMoves rail plan. Recently, a new project has been chugging along, gaining momentum with the support from East Side communities: Oasis Light Rail. 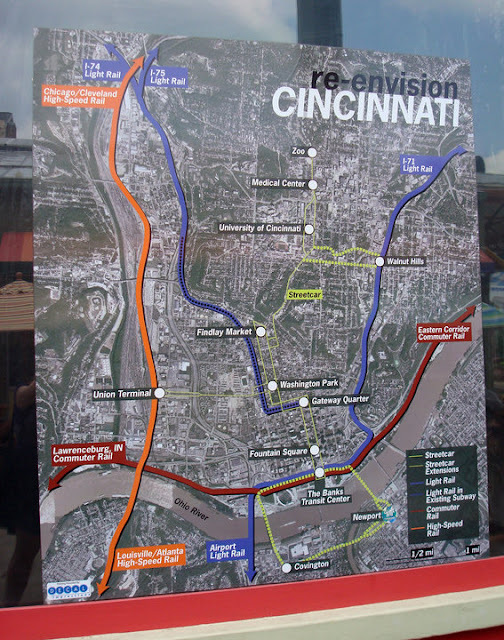 Part of the Eastern Corridor project, the Oasis Line would begin at the Riverfront Transit Center in Downtown Cincinnati, then travel northeast along Route 50 to Milford with seven to ten stations at towns in between. Reaching a distance of 17 miles, stops would be positioned in neighborhoods such as Columbia-Tusculum, Fairfax, Newtown, Lunken Airport, and the East End. Once developed, the Oasis Line would be the first of many rail segments to be built in Cincinnati. The vision is to create additional lines running parallel to I-71 and I-75, commuter rail along Route 50 on the West Side, and high speed rail that connects from Cleveland, Chicago, Louisville, and Atlanta, Georgia. Regional rail would also be able to connect with the Cincinnati Streetcar. The second set of three town hall meetings were recently held by the Ohio Department of Transportation (ODOT) and HDR, the architecture-engineering firm researching the development of the Oasis Rail Line. (If you missed the first meeting in 2011, read about it here.) Free and open to the public, guests could read placards explaining ODOT's progress with planning, get information about the benefits of light rail, and talk one-on-one with engineers working on the project. Patrick, an East End resident, voices his support for light rail. New information for Meeting #2 included ridership projections, proposed station locations, train car design, and route times. 1.) It doesn't operate on evenings or weekends. 2.) There is no commuter service taking passengers from Downtown to the suburbs, just from the suburbs into Downtown. Following, there was a Q&A session with a panel of experts. Light Rail Transit can be up and running in as soon as 2-3 years. The Downtown portion of the Oasis Rail Line could begin construction as early as Fall 2012. The first segment to be complete would be Downtown (Riverfront Transit Center) to Columbia-Tusculum. The cities of Fairfax and Newtown would be part of the second segment of construction. Implementation of light rail costs $1 - $1.5 million per mile of tracks. Other costs are dependent on public input. The desire for more service, more tracks, more stations, or number of hours in operation are all variables in the price. Sketch of Transit Oriented Development around a light rail station. The Ohio Department of Transportation provided a wealth of information for the community and listened to neighborhood feedback. While still in its initial phases, The Oasis could be the first of many light rail lines to criss-cross the Queen City. Interior of a light rail train. Example of how light rail, bike trails, and streets intermingle in San Diego's new transit system. Map of development and land use along the Eastern Corridor. Have input? Submit your opinion on the Eastern Corridor's Feedback page.